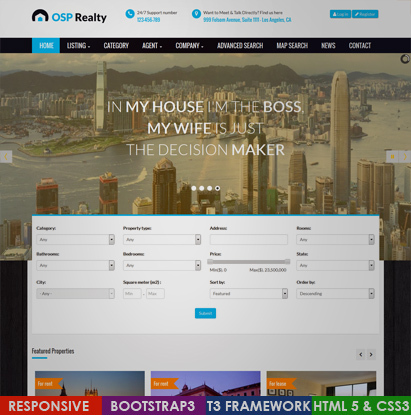 With no exception, OSP Realty is fully responsive template at default, having all the great features T3 Framework has including ThemeMagic and Layout Configuration tool. OSP Realty comes in 6 color schemes. The robust Joomla template framework - T3 Framework is powerful yet flexible, with Bootstrap 3 at core. With T3 Framework, you can easily customize most of OSP Real Estate CSS properties using ThemeMagic in real-time without the need to go too deep into the code along with endless fascinating features. OSP Real Estate is fully responsive Joomla template and looks amazing on smartphones, tablets, and desktops, thanks to T3 Framework. OSP Real Estate is highly customizable: from its flexible layout system to the real time customization tool - ThemeMagic. All are available in OSP Real Estate. If you would like to go all out and fancy, OSP Real Estate will be your best friend. Apart from the default color - Orange, this elegant Joomla template also came with 6 other colors.